Why did you write Tony Hogan? I wanted to, on some level I probably had to. I wanted to explore particular themes in the book for my own personal reasons and to show a part of society that rarely gets any attention in literary fiction. I certainly never thought while writing it that it would be published and for that reason I loved writing it each day. What do you hope people take away from the book? A few laughs, a few tears that needed to be cried, maybe a different perspective about the sort people they made judgments about before. I think when you write a book you have to leave it to be taken however it will be by each individual reader though and hope it’s something worthwhile to them. Which were the hardest parts to write? The end scenes were by far the hardest. Janie has matured, she’s seeing everything clearly and suddenly realises what could be in store for her. But at the same time those scenes that were hard to write are some of the ones that I’m proudest of now; they’re absolutely honest, absolutely truthful. Which were the hardest parts to leave out? The book spans sixteen years so there were lots of decisions to make in terms of leaving things out. I wanted more of Iris and more of the family in Aberdeen but I’m a fairly economic writer so it wasn’t too hard; my most common note on manuscripts is to add in scenes rather than edit something back. When did you know it was finished? I was in Saigon living in a studio bolted onto the back of a Vietnamese family’s home. I’d written a blog post the night before saying I had no idea how I was going to finish the book, that I knew what needed to happen but couldn’t see how to get there. It was rainy season and the next day, as the rain beat down on the metal roof and the kids played noisily in the nursery next door, I started typing without thinking. About four hours I was in tears, had typed the final words and I knew I’d done what I needed to – for myself at least. Interestingly, that section changed hardly at all during the editing process. How much notice do you take of reviews? I treat them like horoscopes if they’re good I am gleeful, smile for the rest of the day and show anyone who’ll look. If they’re bad I call it tomorrow’s chip paper and try to forget it. It’s part of the job so you can’t be sensitive but I’ve also been fortunate that mostly people have embraced Janie and her family. Is winning awards important to you? I’ll tell you if I ever get one! The shortlistings I got last year and this year for Tony Hogan…have made a massive difference though in terms of people taking notice of the book, selling my second novel and being offered other opportunities so I’m hugely grateful. As a debut author awards gave me a recognition and validation where I previously had none. How old do you think you need to be to read the book? I’d love teens to read it. There’s some pretty rough, dark stuff in there but I wouldn’t hesitate at all about passing it onto my own teenage daughter or son if I had one; my greatest hope was that other Janie’s would read it and find some understanding on those pages. If Tony Hogan was a song, what song would it be? The first time I ever heard Jake Bugg’s ‘Two Fingers’ I thought it could be Janie Ryan’s anthem for life. If you could change anything about the book … would you? No, I don’t think so. That was the right book for me, written when it needed to be written and writing it just for the sake of telling the story was such a happy experience for me. As a writer I feel like I’m learning all the time, developing, my writing is largely connected with my insides – my heart and head – and so my writing will reflect the changes in my life as I get older. I love the idea of a collection novels that also tell you all about a person’s life. What’s your next book about? Is it a follow up to Tony Hogan? Thirst is a love story set between present day Hackney and Siberia. 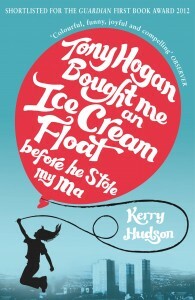 It’s not a follow up to Tony Hogan except that it’s also about normal people, with big, bruised, flawed hearts trying to overcome what life’s given them and chase a bit of happiness. Having written your second novel, do you find yourself concerned with any re-occuring themes? I’m still interested in the same things, and use writing as a way of analysing things that make me curious in some way, so I think it’s natural that there are reoccurring themes. How people with their own fragility find love and look after others. What blows life delivers, why and whether it’s ever possible to get beyond them. Small, simple kindnesses and acts of bravery and how much they can change things. Yes, there’s lots from Tony Hogan that I’m still exploring in Thirst. I’ve done quite a few ‘best of’ or ‘my favourite’ lists recently and what I’ve come realise is that I hunger for three things: a good laugh or some joy, a squeezing at my heart and a decent story where you care what happens next to the characters. With those three it’ll be a good un as far as I’m concerned. What kind of books leave you cold? None really, even really poor ones I’ve read there’s something to be learned form why they don’t work. I have a rule that if I’m not enjoying something I just stop which makes it easier to take a punt. There’s so many good books in the world why would you plough through something you’re not getting off on? What qualities as a writer would you most like to develop and strengthen? So, so many! I would like to be able to write with more choice instead of sitting down and what comes out comes out, which is how it is at the moment. I get my idea, a strand of story and then I write it in the only way I know how. I feel there must be a more controlled way of writing but I remind myself all the time though that, having only written two novels, I’ve years to learn, develop and mature. I’m really excited by the idea that this is the beginning of that. If you could live anywhere else and at any other time where and when would that be? In America at the time of the Beatniks. I was properly obsessed by them when I was about 16 (nope, not a very normal teenager). I think what appealed to me was the meeting of absolute personal freedom and creative productivity. I did end up going to San Francisco and City Light’s Book Store when I was 21 but I would have loved to have gone when the movement, provocative, radical often fairly mental, was emerging. Which writers, living or dead, do you most admire? Roddy Doyle, Anne Tyler, Frank McCourt, A. M. Homes, John Irving, Janice Galloway, Jeanette Winterson, Graham Greene, Sylvia Plath, Jennifer Egan…the list is endless because I admire anyone who writes with truth and does so beautifully and luckily there are plenty like that out there. What function does and should literature serve in 2013? Needless to say on an individual basis very book should inform or entertain, throw a light on the unseen or make the reader feel something or think about something they hadn’t before. Otherwise, what’s the point? Aside from that I think that literature produced at any time in history should be indicative of the society of the that time and its complexities and nuances. I think that literature should show the full spectrum of society whether that’s the case in 2013 I’m not sure. I get up and run while the airs still a bit cold from the morning, I cook a nice big lunch, I write a wee bit (it’s a first draft and I’m still learning what will happen), I cycle to the cinema and see an afternoon film, I write a wee bit more (I don’t know what will happen but I have a good feeling in my bones which is the best you can hope for at first draft), I hit my 1000 words, I meet someone whose company makes me happy and go for a big walk and a talk across this big beautiful city. Basically: daily targets, first drafts and simple pleasures.